Folders Tree View (shortly Tree View) displays the directory tree on your local or network computer. The main purpose of tree view is to select a folder with which some of the software features will work. 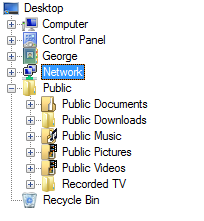 Sprintbit File Manager has a main Tree View displayed on the left side of main window. File Searcher use the tree view where you can select a folder you want to search in. Folders Synchronizer use two tree views where you can select source and destination folders you want to synchronize.